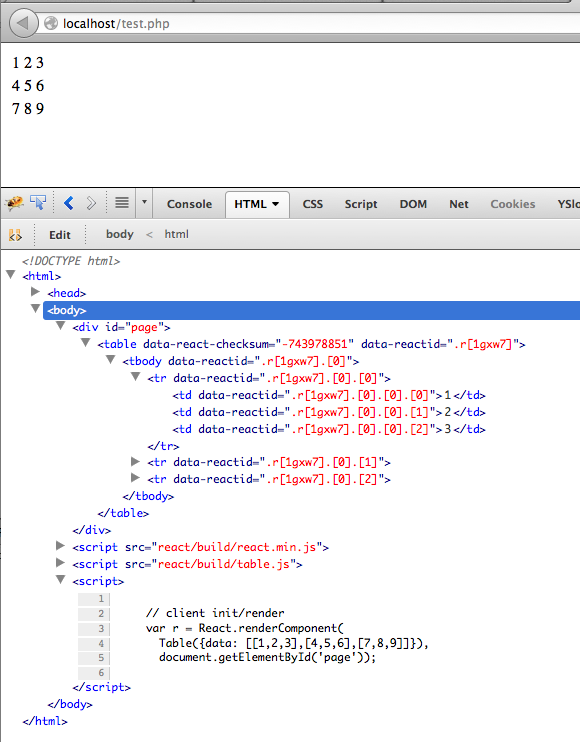 Finally, you take the rendered markup and replace a simple template which takes care of all the html/body/doctype, etc. Then you print it out. In fact, this template will also take care of initializing React on the client. So what goes into this page_template.html? It takes care of the HTML boilerplate, load CSS, and so on. 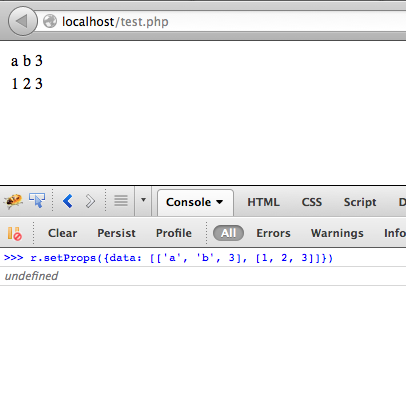 Then it puts all the server-rendered HTML in a div id=page. Finally it loads React.js and custom app .js (which could very well be concatenated into one). Once React is loaded you initialize the client-side, by passing the same $data used to render server-side. So clearly there's a duplication of the data sent to the client: once rendered as HTML and once JSON-encoded. But the JSON encoded data should be very small in most cases. Alternatively you can always DOM-scrape the rendered HTML for the data and pass that back to React, but in most cases the scraping code will probably be longer than the JSON encoded thing. Yet another strategy is to flush only partial data rendered as HTML, only as much (or as little) as needed to make the page appear responsive. Then in a second flush pass all the data as JSON and let React update the UI. Here's a static version of the end result (can't install v8 on dreamhost's shared server) if you want to explore. Thanks for reading, now go play with React. Meanwhile I'll try to clean this code up and setup a standalone project you can fork.